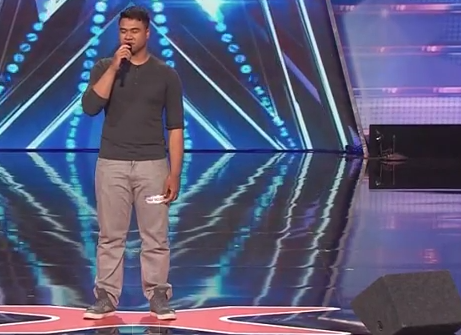 On Tuesday’s America’s Got Talent, soldier Paul Ieti stunned the audience and judges with a fantastic rendition of Rihanna’s “Stay.” He has a really interesting voice, and I think the judges were slightly surprised to witness such a high caliber performance. Following the performance, Mel B hopped up from her seat and ran onto the stage to give Paul a hug. Heidi Klum, who said he’s super special and “thinks he’s a superstar,” followed the hugging action, too. Lastly, Howard Stern got up from his seat, walked up onto the stage, and gave him a hug as well. Howie Mandel didn’t participate in the hugging action; however, he did shower the young singer with praise. The crowd really took well to the performance and, despite the somewhat slow start to the song (the judges wondered if he might’ve missed his cue), it’s apparent that he knocked it out of the park. If you missed tonight’s episode, consider checking out our full recap of the show — CLICK HERE. Paul recently returned from a 9-month tour in Afghanistan and admitted that singing was a method of escape, both for him and his fellow soldiers. Check out the video of Paul’s performance below and let us know what you think. Do you believe this fella’s got star quality — and the necessary talent to bring home $1 million dollars? Leave your thoughts in the comments section below. We’d love to hear from you.